Thank you to everyone who attended last weekend’s open house! If you didn’t get a chance to attend the open house, you can still give input through the Mt. Tabor Reservoirs Interpretive Display Survey. Give feedback on the different types of design options and tell us what you’d like to know the topics featured in the displays, such as Portland’s water system and Mt. Tabor’s history. For more than a hundred years, Mt. Tabor formed a major part of Portland’s water system, with most of the city’s water passing through reservoirs on its slopes. To comply with new drinking water regulations, the Portland Water Bureau disconnected Mt. Tabor’s uncovered reservoirs from the drinking water system in 2015. As part of the disconnection, the Water Bureau agreed to create interpretive displays honoring Mt. Tabor’s important place in the city’s water system. The Water Bureau is working with stakeholders, including the Mt. 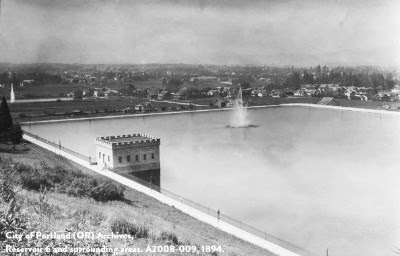 Tabor Neighborhood Association, to design interpretive displays and mobile app content that will tell the story of the reservoirs to park visitors. Visit the Mt. Tabor Reservoirs Preservation Project to find out more about this project and others! For more information contact Tom Carter at Tom.Carter@portlandoregon.gov. Please contact us for translation or interpretation, or for accommodations for people with disabilities.